Many people building a home gym start off with dumbbells. So how is it that one of the simplest pieces of fitness equipment can be one of the most effective? Dumbells are definitely old school, a reminder for many people of old style gyms full of sweaty guys grunting and having huge weights around – and yet they are one of the most versatile pieces of equipment you can own. Just think about it – dumbbells take up much less space than a treadmill, exercise bike, or rowing machine, yet they cost far less than any of them. They are simple to use, easy to store away, and won’t cost you a fortune. The beauty of dumbbells is that anyone can use them, just about anywhere. And because they help to build muscle, they are a key tool in helping to burn fat – because strength workouts boost the metabolism, strength training is one of the most effective fat burning workouts you can do. As with most things, you get what you pay for. At their simplest, dumbbells are simply metal bars with plates of various sizes that you can quickly adjust to change the weight and thus the resistance. This system, has worked great for many years, and if your budget is limited, this is the place to start. 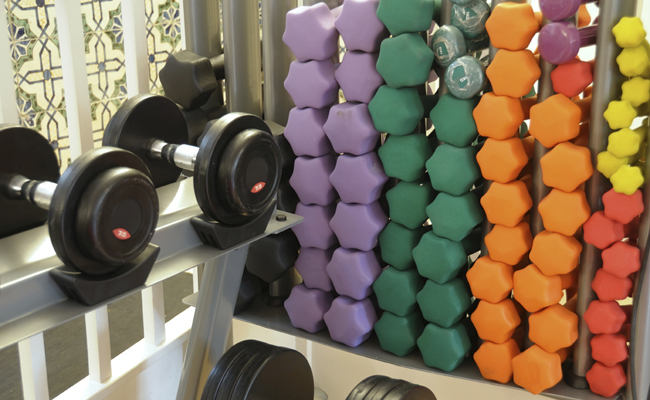 If you have more money to spend, then consider buying a rack of dumbbells with a range of different weights. It will make your workouts quicker and easier as you don’t have to stop and fiddle with the weights between exercises. Weights come in a variety of different finishes. The very cheapest are plastic plates that you fill with sand. Next up are bare metal – they will eventually rust, particularly if you keep them in the garage, for example. Next up are chrome weights, while the most expensive are rubber coated – they cause less damage should you drop them or bang them, and are easier to grip. While you can do hundreds of different exercises standing or sitting on a chair, adding a bench or an exercise ball will give you a platform for working out. For anyone starting a home gym, this is a great place to start, particularly if budget or space are limited. Add an exercise mat and an exercise ball and you can work the whole body in hundreds of different ways.